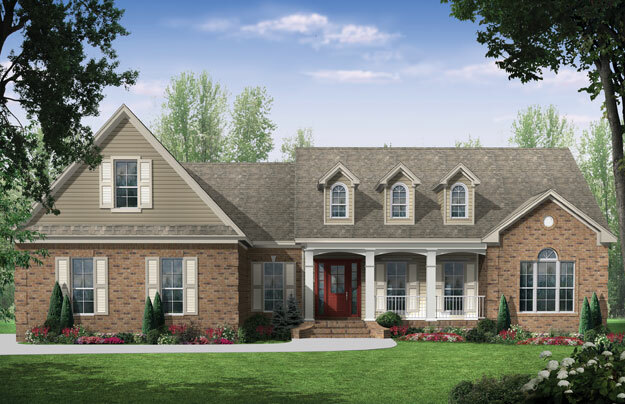 This inviting Ranch house plan combines country styling with upscale features. Front and rear covered porches add plenty of usable outdoor living space, and the rear includes a much-requested feature?an outdoor kitchen. The expansive great room features a beautiful raised ceiling, built-in cabinets, and a gas fireplace. The spacious kitchen offers a pantry and an oversize island with a large eating bar. The split-bedroom plan features three bedrooms, two full baths, and a half bath. The master bedroom has a raised ceiling and adjoining bath with two sinks, oversize corner jet tub, and large his and her walk-in closets. A media/hobby room can also be used as a home office, dining room, or playroom, and the upper level offers an unfinished bonus room. This is a flexible plan, with plenty of exciting options for entertaining guests as well as enjoying comfortable privacy. For more information about any of the home plans, services or books featured on our website, please contact us by either of the methods below. If you have questions about a specific house plan, please provide us with the Plan # to allow us to handle your inquiry more quickly. Return Policy - Since plans, EZ quotes and material lists ordered from ultimateplans.com are printed in response to your order, we cannot honor requests for refunds. It is the plan purchaser’s responsibility to verify all lot conditions, measurements, and code requirements prior to ordering and building. Additional Plan Sets - Additional plan sets are available up to 90 days after your purchase of plan packages or reproducible masters of the same plan. Building Codes & Requirements - Our plans conformed to most national building codes when they were originally prepared. However, they may not meet all your local building regulations. Some counties and municipalities have their own building codes, regulations and requirements. The assistance of a local builder, architect or other building professional may be necessary to modify the drawings to comply with your area’s specific requirements. We recommend you consult with your local building officials prior to beginning construction. Copyrights - Blueprints and other products on this site are considered intellectual property and governed by copyright laws. Reproduction of the illustrations or working drawings for any means is strictly prohibited. The right of building only one structure from the plans purchased is licensed exclusively to the buyer and the plans may not be resold unless by expressed written authorization. One Time License To Build - You may only build one structure per purchased plan package. Purchasing a multiple plan package does not allow you to build multiple times. © Copyright by designer/architect. Drawings and photos may vary slightly. Refer to the floor plan for accurate layout.